Made from an air dried natural FSC certified timber log with natural bark, provides good insulation to the developing larvae inside the tubes and means you do not need to move the log indoors during winter. Appearance may vary due to seasonal availability or environmental factors. 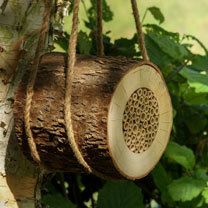 All the tubes are natural drilled canes which are durable and can be used year after year. Hang on a wall, fence or on a tree using its natural seagrass hanging rope, in a sunny position. Ideal hanging height is between ground level and 1.5m. 16 x 19 x 16cm.